Are you looking for a perfume that can perfectly project your youthful and energetic personality? Invictus Paco Rabanne is the answer! This perfume by Paco Rabanne is a fresh and sporty marine scent that has been carefully crafted to represent power, dynamism, and energy in perfection. Either you are a young adult or a mature man who is young at heart, Invictus Paco Rabanne goes along with your signature character. Invictus is made by Paco Rabanne, a French fashion house that is well-known worldwide for their eclectic, unconventional fashion style and innovative fragrances. The company was first founded in 1966 by the Spanish-born fashion designer Francisco “Paco” Rabaneda Cuervo. They have produced a lot of perfume products. The earliest one is the now-legendary Calandre, a perfume for women introduced in 1969. Since then, Paco Rabanne has delivered various fragrances for both men and women. Invictus is a Latin word which means “invincible”. Such name already indicates that this scent is speaking about power and confidence. It aims to project the characteristics of a man who is ready to take action in the face of challenge, a man who sets a goal for his life. It was first launched into the market in July 2013. The perfumers behind this cool and elegant scent are Olivier Polge, Dominique Ropion, Veronique Nyberg, and Anne Flipo. The box is colored in silver. On the front side, you can find the name “Invictus” written over an artistic art of a white ribbon spread across a pair of wing-like objects. Directly underneath, there is the name of the brand and some information regarding the product inside. Opening the box, you are going to be presented with a trophy, as if you are awarded for purchasing Invictus Paco Rabanne. No kidding, the perfume comes in a semi-translucent bottle that is designed in the shape of a trophy. With the unique and distinctive design, Invictus Paco Rabanne can be a nice item for people who like to collect and display their perfume bottles. The scent of Invictus Paco Rabanne is not a very complex one. The scent can be described as marine and oceanic, also quite citrusy. With these main accords, Invictus Paco Rabanne successfully builds and projects the impressions of a masculine modern man. Looking into the main notes, we can see that there are not too many ingredients used, but these ingredients have been carefully and precisely combined. Invictus Paco Rabanne has a strong and solid citrusy opening. The top notes deliver fresh grapefruit and mandarin orange, accompanying the marine accord which leads into the heart notes of aromatic bay leaf and Hedione jasmine. Here, you will enjoy the refreshing and cooling sweetness. The base of ambergris, guaiac wood, oakmoss, patchouli creates a slightly woody atmosphere that surrounds the wearer. The sillage is somewhere between moderate and heavy, making it an effective tool to enhance your presence, and it is also quite long lasting. Considering the relatively affordable and budget-friendly price, Invictus Paco Rabanne makes a very good value for the money. 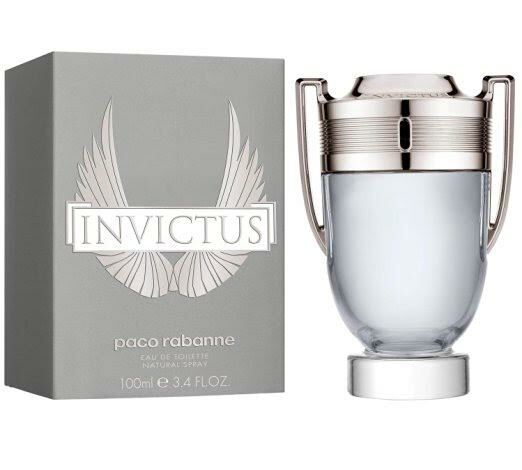 Check the best price for Invictus Paco Rabanne here!